The books in the Essential Bibliographies series include an essay by a noted scholar on the important historiographical issues and a pertinent bibliography for a particular period or theme in military history. They serve as research tools for librarians, researchers, and readers with a professional interest and as a starting point for pursuing further studies. 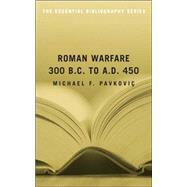 This third volume traces major warfare during the later Roman Empire, from just before the first Punic War (264 B.C.) through the period just prior to the fall of Rome (A.D. 476).